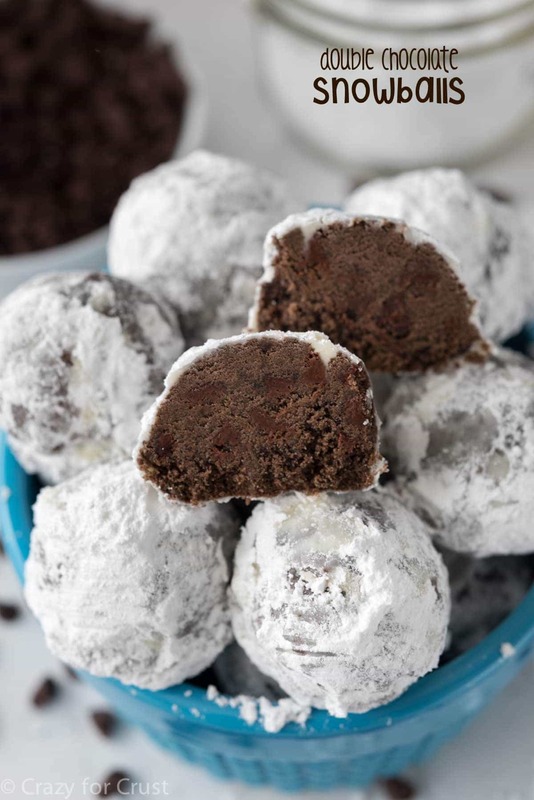 Chocolate Dipped Snowball Cookies – make your favorite wedding cookie or tea cake recipe and dip them in chocolate for a new easy cookie truffle! The perfect holiday cookie recipe. I can’t claim responsibility for this recipe idea. This one belongs to my parents all the way. I wish I could remember which one sent me the idea, but either way it was an amazing one: dip snowball cookies in chocolate, like a truffle. At first, I was intrigued. Why not try it, right? I mean, y’all love snowball cookie recipes and flip out every time I make one. I could at least try to dip them in chocolate and see how it goes. You know how it went? OH MY GOD, SO FABULOUS. If I had to pick a favorite way to eat my wedding cookies, it would be this one. Coated in milk chocolate and dusted with cocoa powder…forever and ever. I mean, you combine my Mom’s Russian Tea Cake recipe, which is probably one of my favorite cookies anyway, and then you coat it in my favorite substance (chocolate)? Really, match made in heaven. Basically this chocolate dipped snowball cookies recipe is a method, not a recipe. Although I do give you a recipe for snowballs, you can use ANY recipe you like. The recipe I list is basic, but make sure and check out some of my other flavors, like chocolate chip or lemon or Reese’s stuffed. They’d all be amazing dipped in chocolate. And if you’re afraid to dip things in chocolate, check out my video on how to make truffles without crying. Ancient video, ancient kitchen, but it gets the point across. 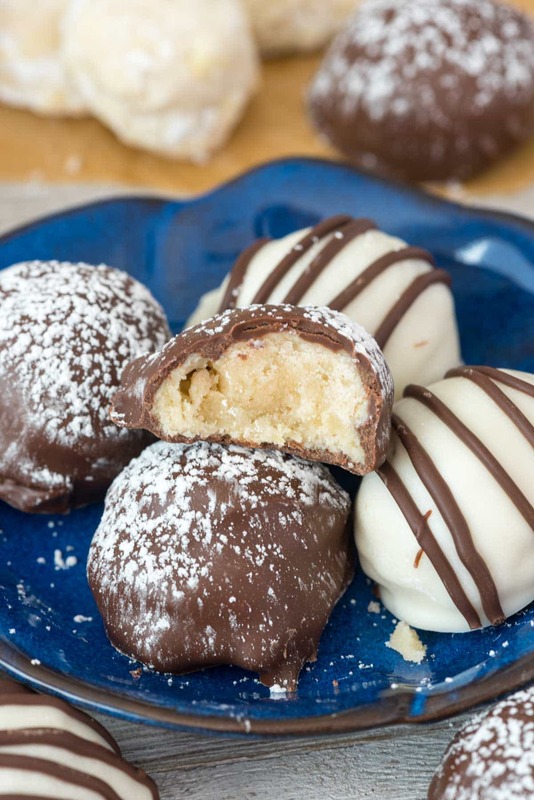 Chocolate dipped snowball cookies are perfect for anytime you want to make snowball cookies a little more special. Or just because you love chocolate and cookies together. 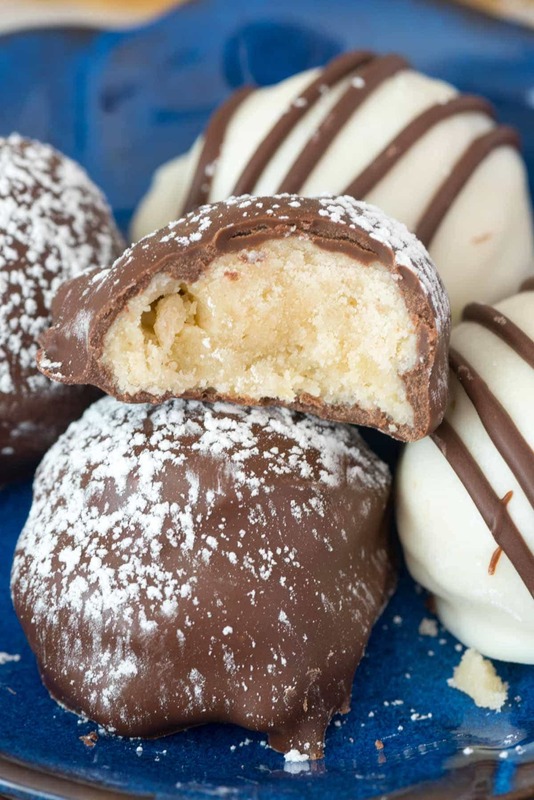 Chocolate Dipped Snowball Cookies - make your favorite wedding cookies and dip them in chocolate for a new easy cookie truffle recipe! Preaheat oven to 375°. Line two cookie sheets with parchment paper or silicone baking mats. Mix butter, ½ cup powdered sugar, and vanilla with an electric mixer until fluffy. Add flour and salt and mix until the dough comes together. Stir in the nuts or chocolate chips, if using. If dough is too soft, chill it until you can work it easily with your hands. It will come together fast with a stand mixer, slower with a hand mixer. Scoop 1 tablespoon balls of dough onto prepared cookie sheets. Bake cookies for 7-8 minutes until bottoms are just slightly brown. Remove from oven and cool completely. Melt chocolate according to package directions. I like to melt it in paper bowls because it's easy clean up. 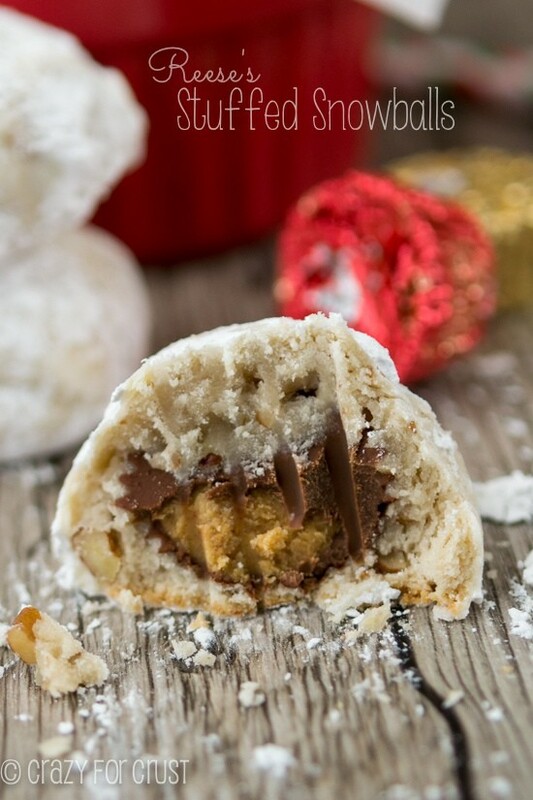 Dip each cookie into the chocolate, roll and tap off excess. Place on a cookie sheet lined with wax paper and chill to harden. You can add sprinkles while the chocolate is wet if you want. For garnish, sprinkle with powdered sugar. GET ALL MY SNOWBALL COOKIES HERE! i never dreamed snowball cookies could get even better! You’re the snowball queen and this is only natural you now have a chocolate dipped version! This looks delicous! Thanks for posting. I love snowball cookies. They’re buttery and kind of fall apart. Like a crumbly shortbread. Not crisp but not chewy either. They’re so good! OMG this is my dream. Why isn’t this more of a thing?? This is so clearly THE best way to eat snowball cookies- love it! 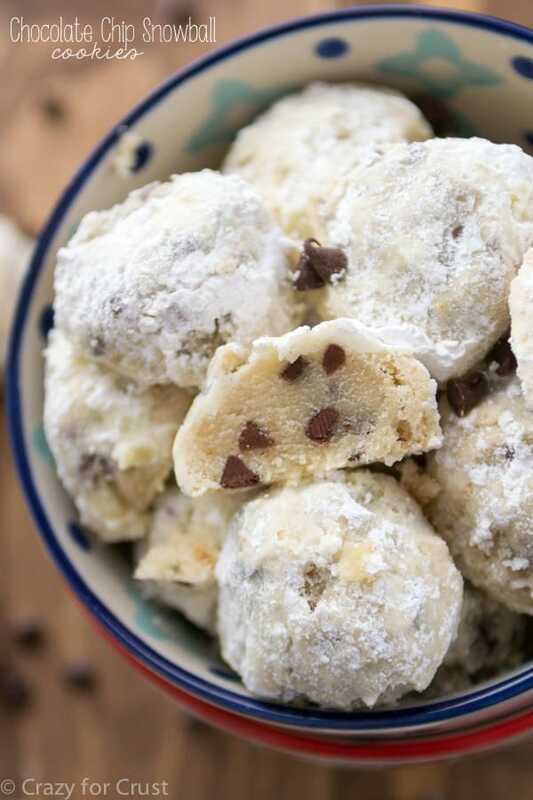 Snowball cookies are one of my favorites, too! I have a question: Can I freeze your snowball cookies with the mini chips? I start my baking early and freeze what I can, and was not sure because of the powdered sugar. Yes I always freeze them! Usually the powdered sugar lasts okay but if not you can just quickly re-roll them for an extra coating after thawing. Thank you Dorothy, and Happy Thanksgiving to you! Question about the chocolate snowball cookies-im not a big fan of chocolate chips on top of chocolate batter. will the cookie change a lot without the chips? Thanks. No, you can skip them! Or even substitute nuts! Hi Dorothy, These have always been my favorite cookies dating back to my days with my Grandmother. I now bake them for Christmas and there are never any to bring home. Thank for sharing. Have a good and safe Labor Day. These are the best…….dipped them in chocolate…..used chocolate chips in the batter…….dusted with powdered sugar…….easy to follow recipe makes it even better…..